Can states and local authorities regulate drones? In this episode of Drone Law Radio, Sarah Nillson and Enrico Schaefer discuss the FAA Fact Sheet on federal preemption, state and local drone laws, private property rights above the ground and other hot topics. The December 17, 2015 FAA Fact Sheet seeks to educate state and local lawmakers on the ‘field preemption’ doctrine. LA Drone ordinance results in prosecution of drone pilots and possible criminal penalties. 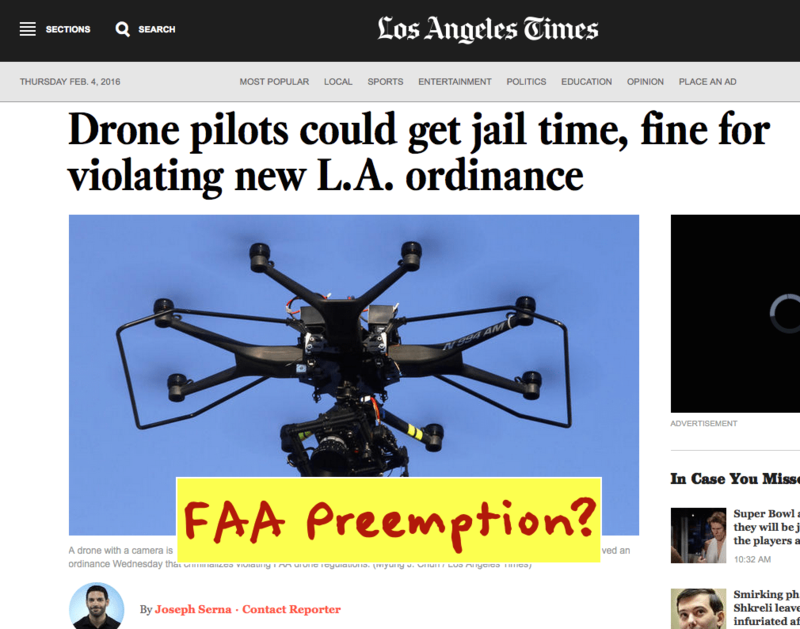 Will the FAA intervene and invoke the ‘field preemption’ doctrine and its exclusive jurisdiction over sUAS regulations and the national airspace. Flight altitude, operational bans, flight paths and any regulation of the national airspace is reserved to the FAA to regulate. These leave very little room for the States and local authorities to target drones as part of their own efforts to restrict drone use. The Boggs case may help define property rights versus FAA filed preemption versus drone operator rights. Does someone have the right to shoot down a drone flying over their property? Will the courts set a altitude which separates a homeowner’s property rights above their yard from a drone operators potential right to fly? What is the altitude which separating the FAA’s jurisdiction over the National Airspace and FAA jurisdiction versus private property rights. Who owns 10 feet above your lawn?